To celebrate the release of Vault 2015 R2, I wrote an app that lets you generate BOM reports automatically through the Vault job server. If you are not already aware, Vault 2015 R2 has a BOM Report feature. From any BOM view, you can run the Report command to generate a report of the BOM that you are viewing. 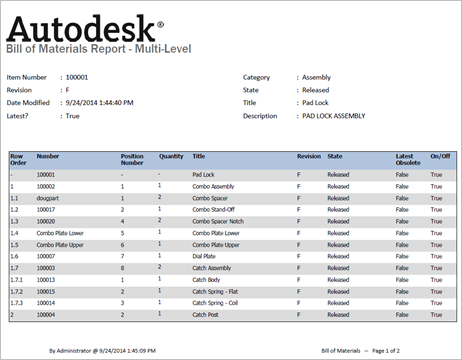 This report uses the same engine as File and Folder reports, which has a good deal of customization options. There are also default templates to help you get started quickly. However, the out-of-the-box BOM Report feature is a manual process. If you want to automate things, my plug-in hooks to job server and lets you trigger reports when items change state. When the job runs, it generates the report, saves it to Vault as a PDF and attaches it to the item. Must have job queue enabled. Must have a “Quick Change” state that the plug-in can use to move the item to edit mode. Must have a folder in Vault for storing the generated reports. To configure BOM Reports, install the app and follow the readme. 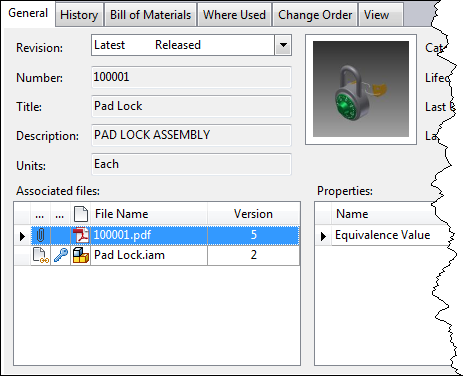 You can find the readme in the install location (%ProgramData%\Autodesk\Vault 2015 R2\Extensions\BOMReportJob). Administrative rights are required to configure the Vault job server. All the apps on this blog have a legal disclaimer on them, but I want to make this one more obvious since it’s dealing with BOM data. BOM Report Job is not an official product. It’s technically classified as a sample app. So please keep that in mind when dealing with these reports. For example, if you are using the report to purchase $50,000 worth of parts, you may want to double check the numbers first before putting the order in. Warning: A new version of Vault has been released to Subscription Center. For the first time in many years, the Vault team put out a full release in between the standard yearly releases. R2 is not a service pack, which is why you need to be careful. If you are installing for the first time, R2 is a good enough starting point. 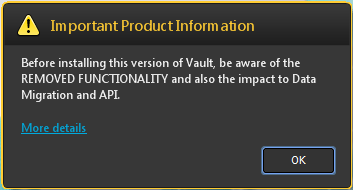 But if you are already running Vault in production, you will probably want to wait until Vault 2016. Upgrading to R2 is only for those who need the new features right now. You thought I was joking about the warning? This is actual UI from the installer. As usual, I’ll stick to the API-related stuff and leave it to other blogs to go over the end-user feature set. There is a pretty good overview over at Design and Motion. Just like with any other full release, 2015 R2 has it’s own SDK with its own DLLs and web services. The 2015 release has 19 as the version number. Technically it should be v20 in the path. The important part is that it’s different than v19, which is the path to the 2015 web services. * = No compatibility for Item and Package services. Those services are completely disabled. Package Service disabled for R2. Almost every function will return an error. Plug-in compatibility: As usual, plug-ins need to be re-compiled for each version. The .vcet.config files need to reference version “20.0.0.0” of any Vault SDK DLLs. When developing for the Autodesk Exchange app store, “V2015R2” is the value to use for the SeriesMin and SeriesMax values in the package.xml. Vault Office Client and the full Vault Explorer Client are binary equivalents. Any plug-in you write will load in both clients. There is no way for your code to detect which client it’s running in. R2 uses .NET 4.5 and Visual Studio 2012 is still the recommended IDE. No change from 2015.